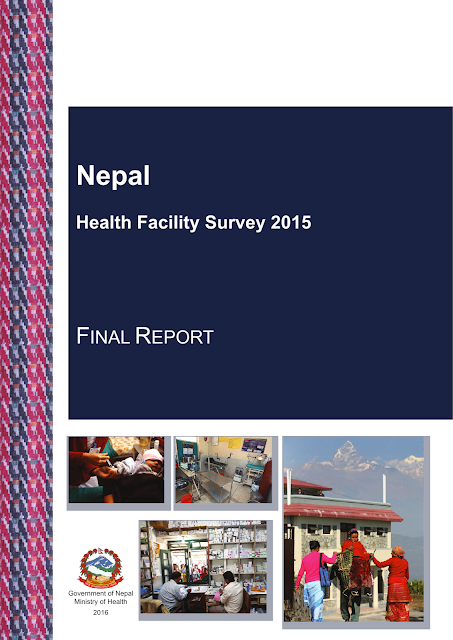 The 2015 Nepal Health Facility Survey (2015 NHFS) is the first comprehensive assessment of health facilities in Nepal that harmonizes various health facility among the Ministry of Health and health development partners. It was designed to provide information on the availability of basic and essential health care services and the readiness of health facilities to provide quality services to clients. The NHFS collected information on the general readiness of facilities to provide quality health services. The survey also obtained information on the availability of each of the following services: child health care; maternal and newborn care; family planning; services for sexually transmitted infections (STIs), HIV/AIDS, tuberculosis- and malaria-related conditions; and services for non-communicable diseases (NCDs) (diabetes, cardiovascular diseases, and chronic respiratory diseases). For each of these services, the 2015 NHFS assessed whether components considered essential for quality service delivery were present and functioning. The 2015 NHFS provides representative results for Nepal, for different facility types (public hospitals, primary health care centers [PHCCs], health posts [HPs], urban health centers [UHCs], standalone HIV testing and counseling sites [HTCs], and private hospitals), for different managing authorities (government and private), for each of the three geo-ecological regions in the country, the survey was also designed for representative results for each of the 13 development-ecological zones and for the area affected by the 2015 earthquake (14 districts). Key findings of the 2015 NHFS that follow are organized according to the topics of the chapters in this report. About 8 in 10 facilities have an improved water source and client latrine, half of facilities have regular electricity, and one-fifth of facilities have communication equipment. However, only 1 in 10 facilities have a computer with Internet access. With the exception of an adult weighing scale, a blood pressure apparatus, and a light source, public health facilities are more likely to have basic equipment available than private health facilities. Only about half of facilities have both soap and running water. Nearly all health facilities in Nepal offer child curative care, family planning, antenatal care, malaria diagnosis and/or treatment, and non-communicable disease services. Sexually transmitted infection (STI) diagnosis or treatment services are less commonly available. About two-thirds of Nepal health facilities offer the package of basic client services (outpatient curative care for sick children, child growth monitoring, child vaccinations, any modern method of family planning, antenatal care, and services for STIs). Of 18 tracer medicines, only chloramphenicol capsules/applicap, cotrimoxazole suspension or dispersible pediatric dose tablets, and RHZ (isoniazid + rifampicin + pyrazinamide) are available in less than half of health facilities. Only 37 percent of facilities conduct regular management meetings, and 35 percent involve the community in these meetings. Around two thirds of facilities have both routine staff training and personal supervision. Outpatient curative care for sick children is available in almost all health facilities in Nepal at least five days per week. Eighty-five percent of facilities offer all three basic child health interventions: outpatient curative care for sick children, routine growth monitoring, and routine childhood vaccination. Ninety-four percent of facilities provide routine vitamin A supplements for children. ORS, zinc tablets, albendazole, vitamin A capsules, and paracetamol syrup/suspension were available in 85 percent or more of the facilities offering child curative care services. Similarly, amoxicillin was available in one-quarter, cotrimoxazole in one-half and gentamycin in about two third of the facilities offering child curative care services. A thermometer, stethoscope, and timer were available in more than 9 in 10 facilities. Fifty-four percent of health facilities providing child curative care had soap and running water or alcohol-based hand disinfectant for hand cleansing. More than 7 of every 10 providers of child health services have received recent supervision, and 3 of every 10 have received recent in-service training related to child health. Providers assessed all three main symptoms (fever, cough/difficult breathing and diarrhea) in one-quarter of observed consultations and checked for all three major danger signs (ability to eat or drink anything, vomiting and convulsion) in only 2 percent of consultations. Almost all (97 percent) health facilities in Nepal offer (that is, provide, prescribe, or counsel clients on) at least three temporary modern family planning methods. Government health facilities are more likely to offer modern family planning methods than private health facilities. Combined oral contraceptive pills, male condoms, and progestin-only injectables (Depo) are the most commonly offered family planning methods. Long-acting reversible contraceptives (implants and intrauterine contraceptive devices [IUCDs]) are offered at half of health facilities where family planning services are available. Virtually all facilities where family planning services are available are able to provide male condoms, oral contraceptives, and injectables to clients at the facility. However, only around one in five facilities where family planning services are available provide IUCDs and implants at the facility. Ninety-five percent of health facilities that provide family planning methods actually had every method they provide available on the day of the visit. Overall, 16 percent of the interviewed family planning service providers reported that they had received in-service training related to family planning in the 24 months before the assessment . Just over 1 in 10 family planning service providers have ever received in-service training on long-acting reversible contraceptive methods. Hand-washing supplies were seen in just over half of health facilities offering family planning services. Overall, the environment for family planning counseling is poor. Visual and auditory privacy and confidentiality were assured in only 6 percent of the family planning consultations observed in the survey. There was almost no discussion of sexually transmitted infections or condoms during observed consultations. Method-specific side effects were discussed in a little more than one in five consultations. About 98 percent of health facilities in Nepal offer antenatal care (ANC) services. One in four health facilities offering ANC had at least one staff member who had received inservice training in ANC within the 24 months before the assessment. Twenty-five percent of facilities had ANC guidelines available on the day of the assessment. More than half of facilities had soap and running water or alcohol-based hand disinfectant for infection prevention available at the service site on the day of the assessment. Ninety percent of health facilities had all essential ANC medicines (combined iron and folic acid tablets, and albendazole tablets) available for ANC clients. Almost half of all observed ANC clients were counseled on nutrition during pregnancy. One third of clients were advised on issues relating to the progress of their pregnancy. Two out of ten clients were counseled on importance of at least four ANC visits and on birth/planning/preparedness measures. Seven in 10 ANC providers had received personal supervision in the six months preceding the survey. Two of every 10 facilities offering ANC provide at least some services for prevention of mother-to-child transmission (PMTCT) of HIV. Only 6 percent of facilities offering ANC had insecticide-treated nets available to give to ANC clients for malaria prevention. Around half of health facilities in Nepal provide normal vaginal delivery services. Almost all hospitals and primary health care centers (PHCCs) offer these services. Just over one-third of facilities that offer normal vaginal delivery service had at least one interviewed staff member who had received relevant in-service training in the preceding 24 months. Six out of 10 facilities that offer normal vaginal delivery care have emergency transport available. Around 9 in 10 facilities that offer normal vaginal delivery services had injectable uterotonic (oxytocin) and an intravenous fluid infusion set on the day of assessment, and more than 70 percent had injectable magnesium sulphate. On average, 11 percent of facilities had all medicines regarded as essential for delivery care. Seventy-seven percent of zonal and above hospitals had all essential delivery care medicines on the day of the assessment, as compared with only 5 percent of health posts (HPs). Nearly 4 in 10 health facilities had carried out neonatal resuscitation. More than two-thirds of zonal and above hospitals had carried out all comprehensive emergency obstetric and newborn care (CEmONC) signal functions at least once in the three months preceding the survey, as compared with one-fifth of district hospitals. Only 3 percent of PHCCs had performed all basic emergency obstetric and newborn care (BEmONC) signal functions at least once in the three months preceding the survey. More than 90 percent of facilities routinely carry out a number of essential newborn care functions including keeping the infant warm, starting breastfeeding soon after birth, and putting the baby skin-to-skin on the mother’s abdomen. About 6 percent of health facilities in Nepal have an HIV testing system. Almost one-third of facilities that have HIV testing capacity have adequate hand cleaning supplies—either running water and soap or alcohol-based hand disinfectant—at the HIV testing location. Five percent of all facilities offer HIV care and support services. Twelve percent of facilities offer antiretroviral therapy (ART) services. Among facilities offering these services, 80 percent had the first-line ART regimen available in the facility on the day of the assessment. Three out of every four facilities offer sexually transmitted infection (STI) services. However, less than 1 in 10 facilities have at least one provider with recent training on the diagnosis and treatment of STIs, and only 16 percent of facilities have the capacity to screen for syphilis infection. A majority of health facilities in Nepal offer services for the diagnosis and/or management of chronic respiratory diseases, and 73 percent of facilities offer services for cardiovascular diseases. About one in five health facilities offer services for the diagnosis and/or management of diabetes. On average, no more than 5 percent of facilities offering services for diabetes, cardiovascular diseases, or chronic respiratory diseases have providers who received training in these services during the 24 months preceding the survey. The availability of guidelines for provision of non-communicable disease (NCD) services is consistently low. Equipment such as a blood pressure apparatus, weighing scale, and stethoscope is available in a majority of facilities that provide NCD services. Other equipment, such as height boards, peak flow meters, and spacer devices, is less available. The availability of essential medicines for these conditions is low in most facilities other than hospitals. TB diagnostic services were mostly concentrated at the primary health care center (PHCC) level and above. Nationally, TB treatment services were available in 86 percent of health facilities. TB diagnostic and treatment services together were available only in a third (30 percent) of facilities. Only one-third of facilities offering tuberculosis diagnosis and/or treatment services had diagnosis and treatment guidelines available. Facilities in the mountain region were least likely to have guidelines. Only 17 percent of facilities that offer tuberculosis diagnosis and/or treatment services had staff with any recent in-service training related to TB. Only 10 percent of facilities had the capacity to carry out TB smear microscopy or x-ray services for the diagnosis of TB. Less than 1 percent of facilities had the capacity to carry out culture and rapid diagnostic tests. Only 4 percent of facilities offering tuberculosis diagnosis and/or treatment services also had HIV diagnostic capacity. First-line anti-TB drugs were available in the majority (77 percent) of facilities. Half of Nepal’s health facilities offer diagnosis and treatment for malaria. About one-fifth of health facilities have at least one staff member recently trained in malaria diagnosis and/or treatment. Sixty percent of facilities that offer malaria diagnosis and/or treatment services had first-line medicines (mainly chloroquine and primaquine) for the treatment of malaria available on the day of the assessment visit. Despite the policy of promoting free distribution of bed nets to antenatal care clients, only 11 percent of health facilities that provide malaria services had long-lasting insecticide-treated mosquito nets (LLINs) in stock for distribution.